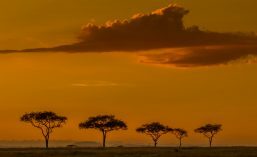 Marievale bird sanctuary is located outside the town of Nigel about 65 kilometres south of Johannesburg in South Africa. This is my “go to” bird photography practice ground. It is mid-spring in this part of the world, and the first migrants have just started to arrive. The European Bee-eaters have just arrived with that familiar liquid “prreee or prruup” call as they hunt insects in the early evening, flying about 30 metres above the ground. We have not yet heard a cuckoo calling and neither have we seen the Amur falcons on the overhead power lines. The weather is warm and the avian residents were out in force. We are still waiting for our first good rains of the season but there was water in the Marievale wetland. It was not too deep so we found avocets and many of the waders were in their element. Also enjoying the shallow water were a variety of herons. Last Sunday at Marievale, we had some good sightings of several of our local heron species. 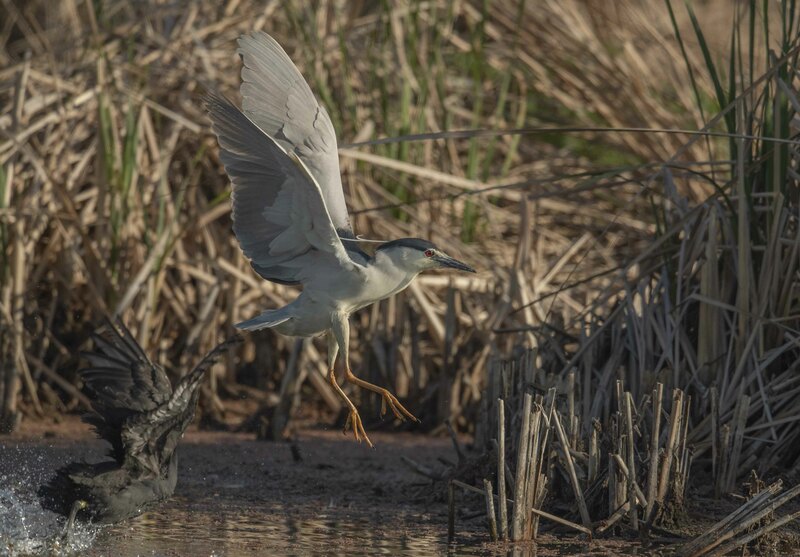 It is always special to see a Black-crowned night heron. This is a nocturnal hunter so I was surprised to see it out hunting in the bright sunlight at around 7h00. A yellow-billed egret in breeding colours. The breeding colours become apparent at this time of the year. The top of the legs turn a yellowish colour and at times the skin around the eye turns a green colour. 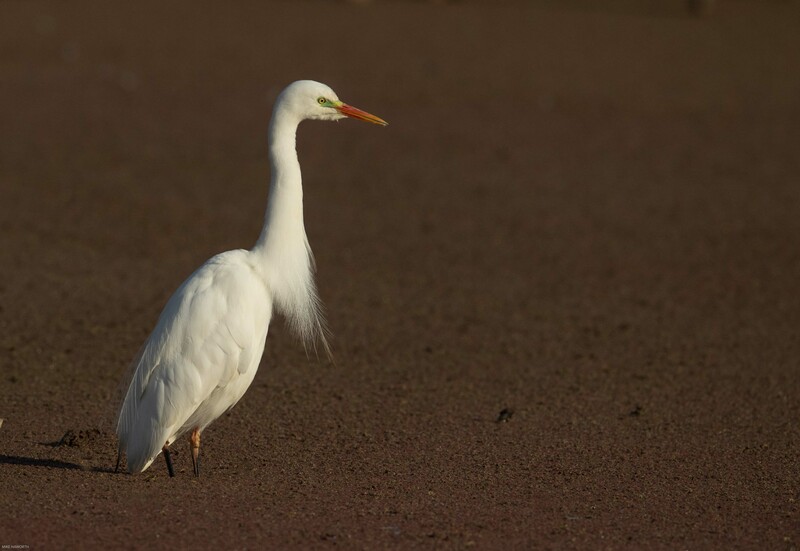 In the breeding season many of the egrets develop plumes on their necks and backs. 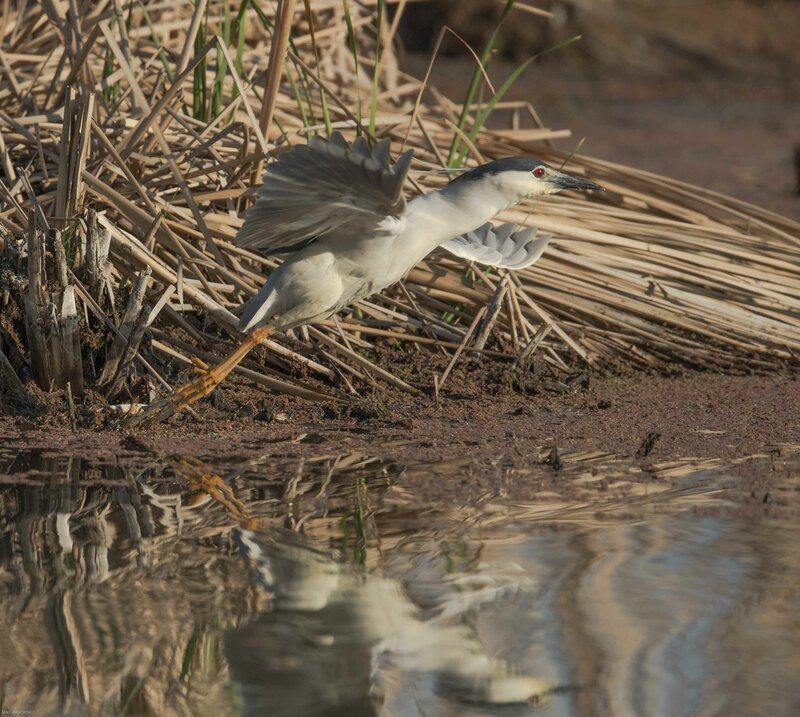 The Yellow-billed egret is distinguished from its larger great White egret cousin as its gape finishes below its eye and not behind it as with the Great White egret and it is smaller. 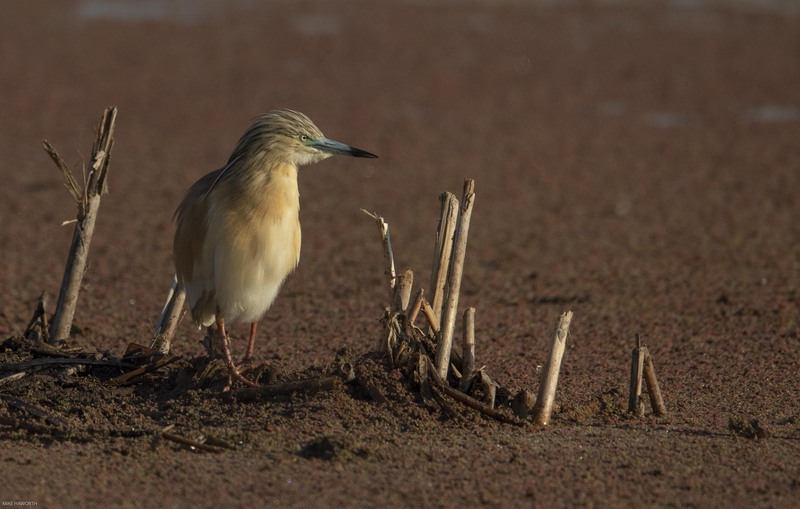 We found many Squacco herons, all hunting individually. They are beautifully adorned with buff and cream coloured feathers. The wings are white and their legs and beak are yellow. Squaccos have an ability to elongate their necks when perch hunting above the water. They are also capable gymnasts, precariously hanging on to reeds to give them a superior hunting position. They are also capable of hunting from branches over the water. 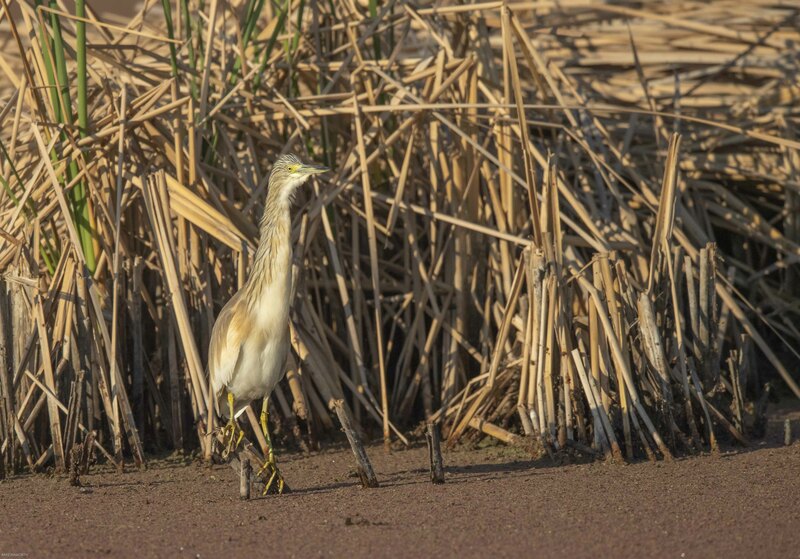 Squacco herons are crepuscular hunters normally feeding in the twilight times, generally in the shallow water among the vegetation at the edge of a pond or river. Squaccos are versatile feeders eating anything from flies to snails and when the opportunity presents itself a small fish, and there is no sharing. 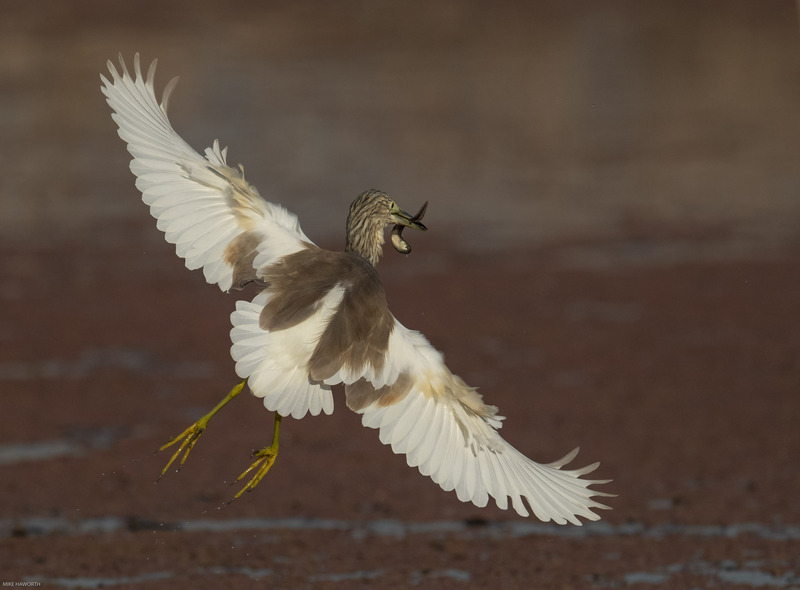 We have two types of night heron in south Africa, the Black-crowned and the White-backed. Both are nocturnal hunters so are not regularly seen. Usually we see them at last light. 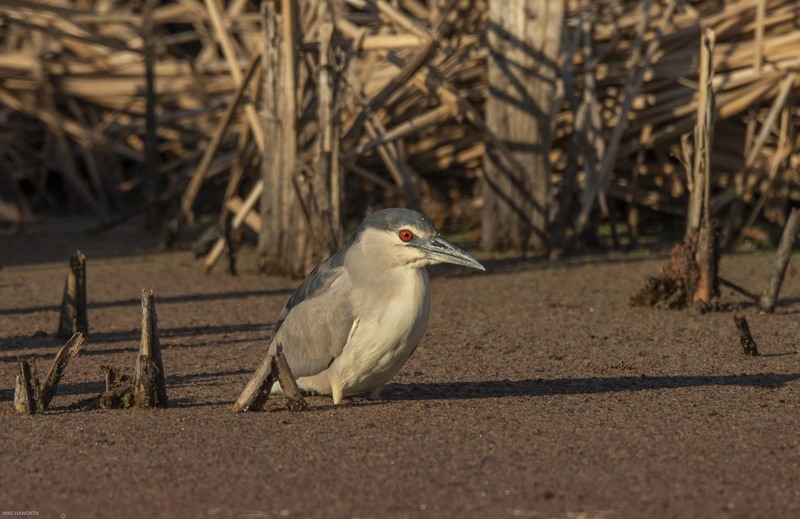 These Night herons have a distinctive black crown and back with the remainder of the body white or grey, red eyes, and short yellow legs. They have pale grey wings and white under parts. They have two or three long white plumes which extend from the back of the head, and which stand out during greeting and courtship displays. As with many herons, the male is larger. 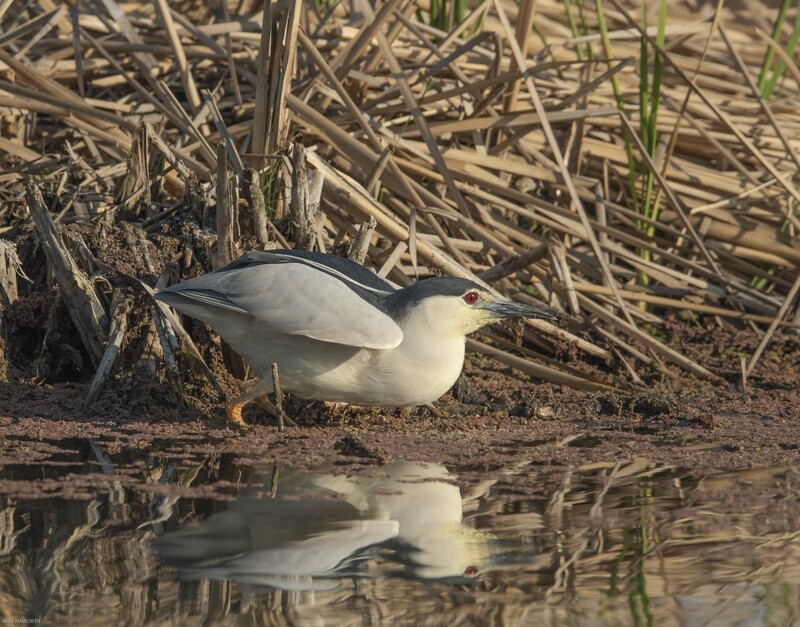 This Black-crowned night heron happened to get too close to a Red-knobbed coot. During breeding season these coots are territorial and aggressive, chasing away birds ranging from ducks to herons. 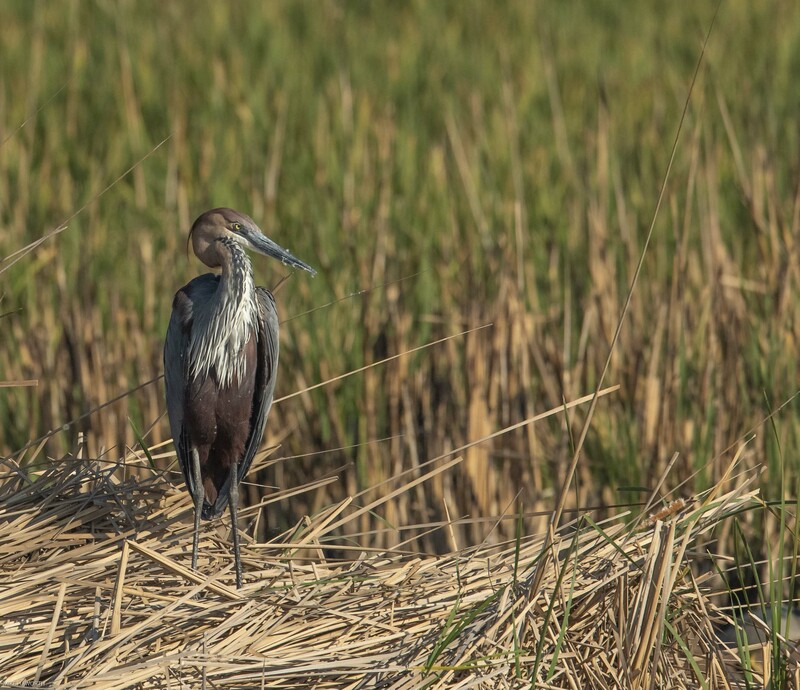 A heron which we normally see hunting in the grass along the road through the wetland is the Black-headed heron but for some reason, perhaps it was too dry, we did not see one. We did see many Grey herons. They have a white head and neck with a broad black stripe that extends from the eye to the black crest. Its body and wings are grey. Its primary and secondary wing feathers are black. 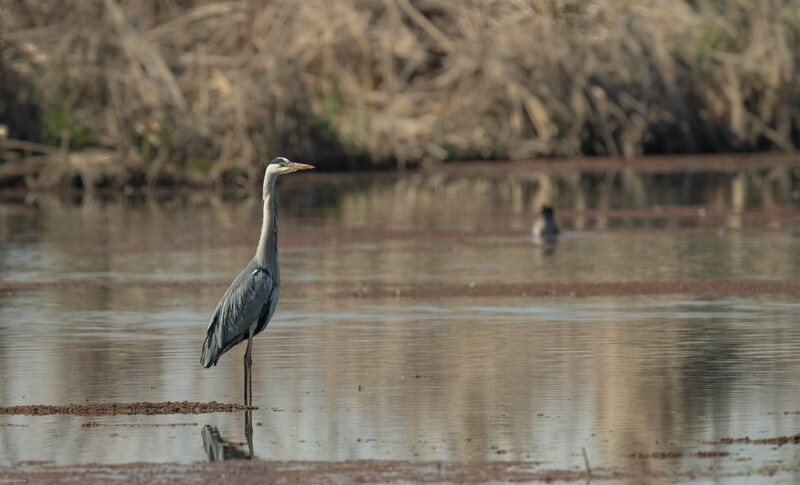 These herons can stand motionless for longer than you can sit and wait for them to strike. 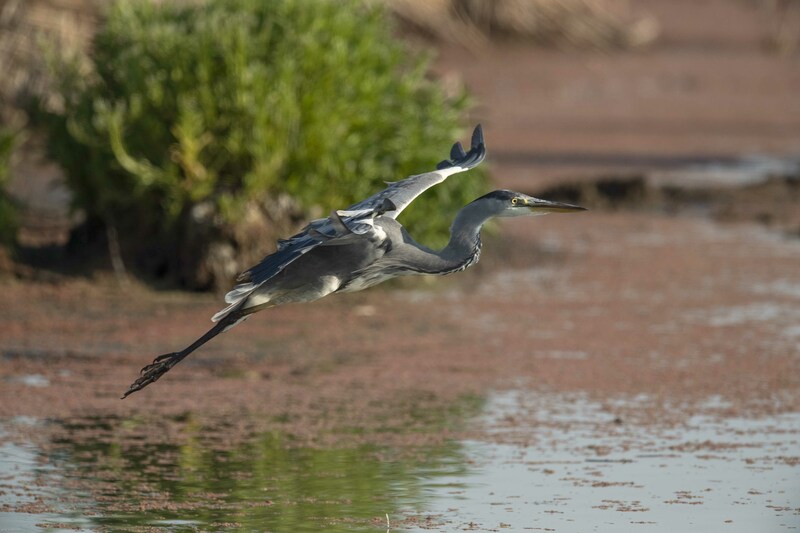 Heron have a varied diet and will eating anything from fish to insects and even small birds. This particular Grey heron caught a large Catfish which it was determined to swallow. We never saw the end result as it flew into the reeds to eat in peace. This was the first time I have seen a Goliath heron at Marievale. 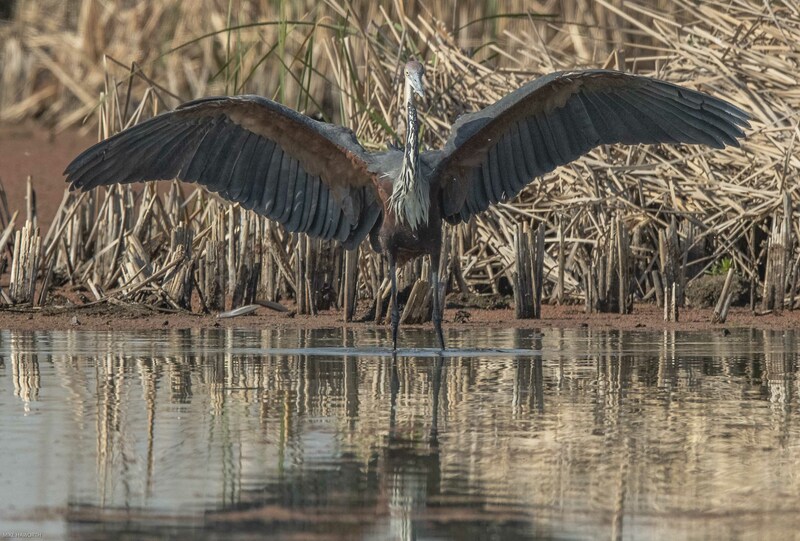 This is a large heron standing up to 1. 5 metres tall. Its distinguishing features are firstly its size and secondly its colour. 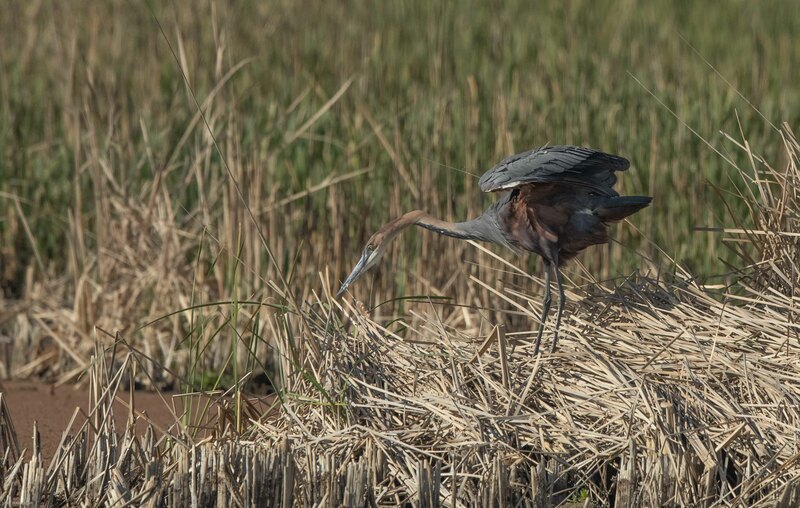 From far, you might mistake it for a Purple heron, but as soon as you get closer you see its size and its striking and unique colouring. The Goliath heron’s head and its bushy crest, face, back and sides of the neck are chestnut. This character had especially dark colouring. The back and upper wings are slate-grey, with a chestnut shoulder patch at the bend of the wings. Its primary and secondary wing feathers are grey. The Goliath heron has a distinct deep “kowoork” sounding bark which can be heard from far off. 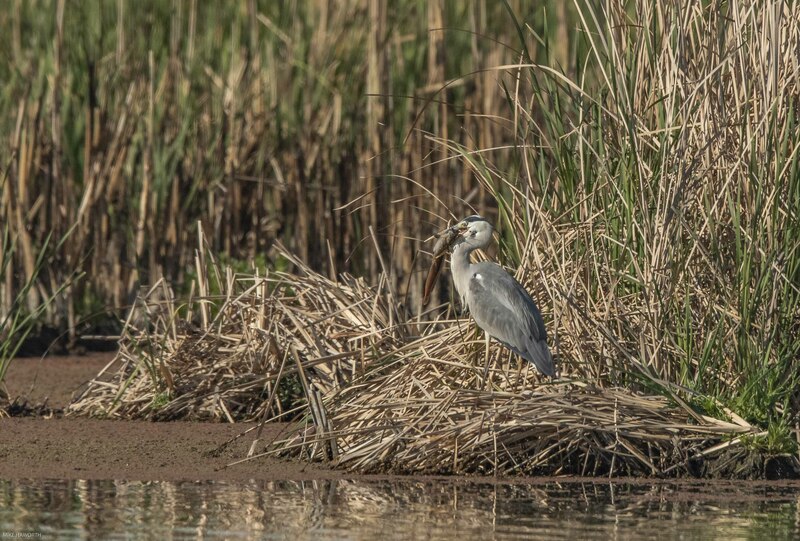 This species of heron sticks to the watery environment. It also hunts alone and is aggressively territorial. Goliath herons often have to cope with Fish eagles trying to steal their catch. Although there is a pair of Fish eagles at Marievale, this character got to hunt in peace. We did not see the Black-headed heron or the Green-backed heron but it was a fruitful photographic morning. There are 64 species of heron around the world. They are carnivorous feeders and have managed to thrive and are not considered threatened or endangered – a celebration of life for sure. 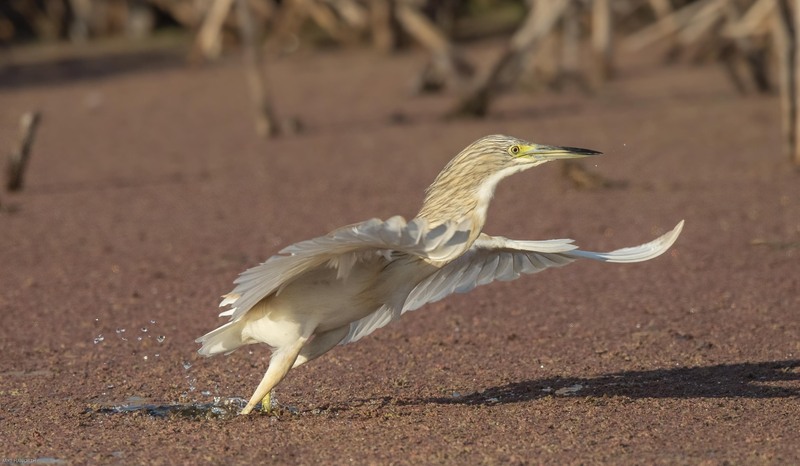 Herons, by evolutionary adaptation, have long beaks. 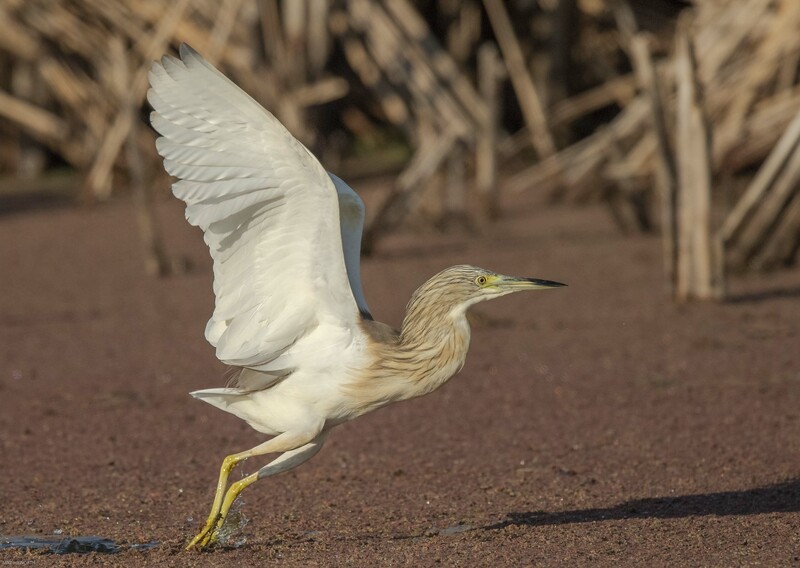 Although herons resemble storks and cranes, they differ from these in flying with their necks retracted, not outstretched for longitudinal balance. They are also one of the bird groups that have powder down. Herons wade and stork usually do not. What a Heavenly Host of Herons!